FONDA — Voorheesville improved its early-season record to 3-1 with a 14-2 non-league victory over Fonda-Fultonville Saturday at Fonda-Fultonville High School. Kellen Chowenhill led the Blackbirds with a double, single and two RBIs. Joey Saia had a double, single and an RBI, while Mason Wight singled and drove in two, and Alex Sapienza, and Colby Hoffman both singled and picked up an RBI. Nick Angelo and Mason Wight chipped in with a single and two RBIs each. Brady Myles and Cade Kearns had two singles apiece for Fonda-Fultonville, while Myles Andersen, Riley Cole and Charlie Susi all singled. 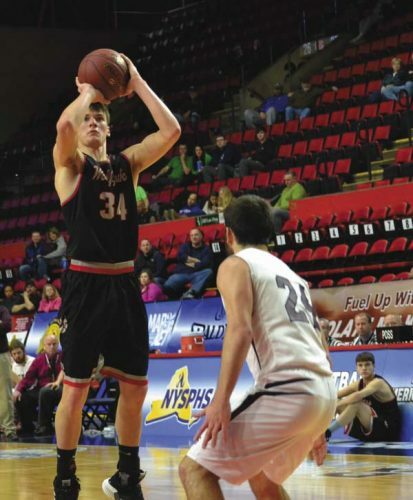 The Braves (1-3 overall, 1-1 WAC) is slated to host Schoharie Monday in a Western Athletic Conference game, while Voorheesville is scheduled to host Cohoes Wednesday in a Colonial Council game. Hoenig, Fullerton (6) and Guiry; Cole, Andersen (3), Hamlen (6) and Myles, Lawyer (4). FORT PLAIN — Troy Butler singled four times, drove in three runs and scored three runs to lead Fort Plain to the non-league victory over Herkimer Saturday at Phillips Field at the Fort Plain Sports Complex. Taylor Gifford added two singles, two RBIs and two runs scored, while Brady Fureno singled twice, scored and drove in two runs and Zach Reid and Bryce Thibodeau had a single, two RBIs and two runs scored apiece. Mike Mussaro led Herkimer with two singles, an RBI and a run scored, while Mike Mulonucki doubled and singled and P.J. Gurtouski had two singles and an RBI. Allexander, Tero (4) and Gurtouski; Thibodeau, Cortese (4) and Fureno. 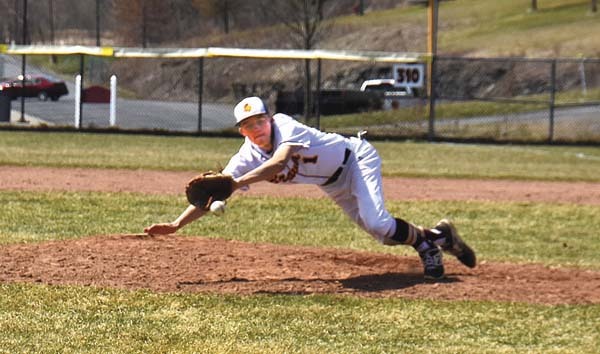 CANAJOHARIE — The Schoharie Indians put up 14 runs over the final three innings to defeat Canajoharie in Western Athletic Conference league action Saturday at Canajoharie High School. Shane Helmstadt gave up eight hits and struck out 12 ton the mound and homered twice, doubled drove in three runs and scored five times for Schoharie. Cam MacDonald collected four RBIs, on three singles, while Bailey Smart had three singles and two RBIs to go with a double and two RBIs from Quin Barton. 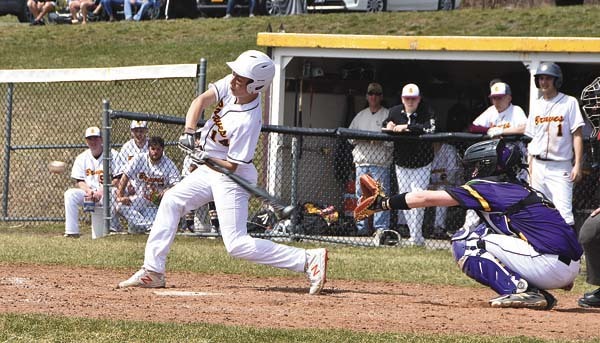 Cian DiMezza led Canajoharie with a double, two RBIs and a run scored, while Derek Hyney had two singles, an RBI and a run scored, while Isaiah Logan and Richie Tamsett both singled, drove in a run and scored for the Cougars. Helmstadt and Scheuer;; Blakeslee, Hyney (1), Tamsett (4), Shariff (6) and Herget. BROADALBIN — The Broadalbin-Perth Patriots swept a doubleheader Saturday at Broadalbin-Perth High School. The Patriots opened the day with a 9-8 victory over Hoosic Valley before taking on Duanesburg in the second game and posting an 11-3 non-league victory. Brodryk Benton tripled, double and singled twice to drive in three runs and score twice against Hoosic Valley. Jake Galarneau added a double and a single to go with an RBI, while Justin Hertik singled, drove in a run and scored for the Patriots. Justin Sawyer tripled and singled, drove in two runs and scored for Hoosic Valley, while Isaac Carlo picked up two RBIs and a runs scored with four singles. Ryan Visco, Jack Marsden and Sammy Vainauskas all doubled for BP against Duanesburg. Visco picked up two RBIs and a run scored, while Marsden added three singles to go with two RBIs and two runs scored and Vainauskas had a run scored. Benton added two more singles, an RBI and two runs scored to his credits on the day.